Size: 24"(Length) x 12"(Height) x 12"(Width) Pure and genuine goat leather , vegetable oil tanned for shiny shades. (Pic 1): A classy square shaped Duffel bag with adjustable shoulder strap, small front pocket for keeping accessories. Original Goat Leather gives beautiful shades of vintage charm with each camera angle. (Pic 2): Showcasing 1 small pocket in front for keeping accessories. (Pic 3): Showcasing 2 side compartments and one main large space. The inside is lined with high quality canvas. Note: Leather used for these bags is still processed in the traditional ways that have been around since generations. It is not processed by use of chemicals or dyes but by traditional methods of sun tanning and hand done vegetable oil polish. The leather gets softer with age and develops a unique texture and finish. 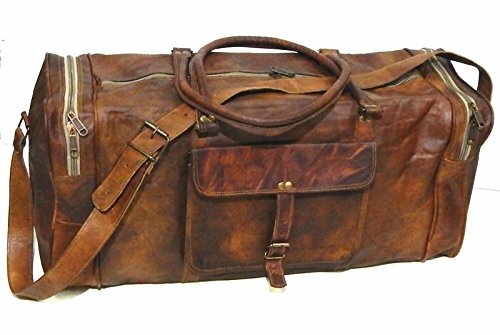 Also because of the natural tanning processes the leather bag could have a distinctive smell that fades away with days of use. Most of our customers tend to like this earthly smell, some don't. In any case it does fade away within 4-6 weeks of regular use. Please be aware that pure leather by its nature has some scars (due to marking/cuts on goat skin) which reconfirms that its 100% genuine and also makes every bag one of a kind and adds character to your prized possession. Also each bag has distinctive color tone, which may deviate a little from given pictures. NOTE: Leather bag have a distinctive SMELL that fades away with days of use. Most of our customers tend to like this earthly smell, some don't. NOTE: Buckles and Metals used in this bag are a bit rusty to give this bag a vintage look. Because every bag is handmade from leather which is naturally tanned and not chemically treated, each bag has unique and individual markings and coloring's and may vary slightly from our photographs. If you have any questions about this product by Firu-Handmade, contact us by completing and submitting the form below. If you are looking for a specif part number, please include it with your message.